Why did Moses have a staff in his hand? Recently during a mid-week Bible study, a brother presented a short talk on the question the LORD asked Moses. We are not surprised to find a staff in the hand of Moses. Earlier in the same context we have learn that Moses was shepherding the flock of his father-in-law Jethro. 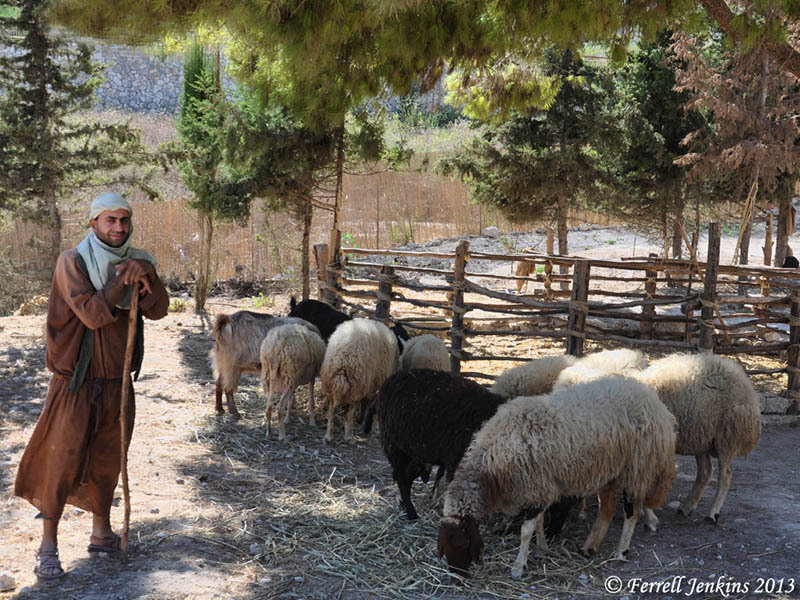 Shepherd with his sheep at Nazareth Village. Photo by Ferrell Jenkins. The staff and the rod (Psalm 23:4) were the tools of the shepherd of Bible times. Here is a brief comment about the rod and staff from the Florida College Annual Lectures of 1993. 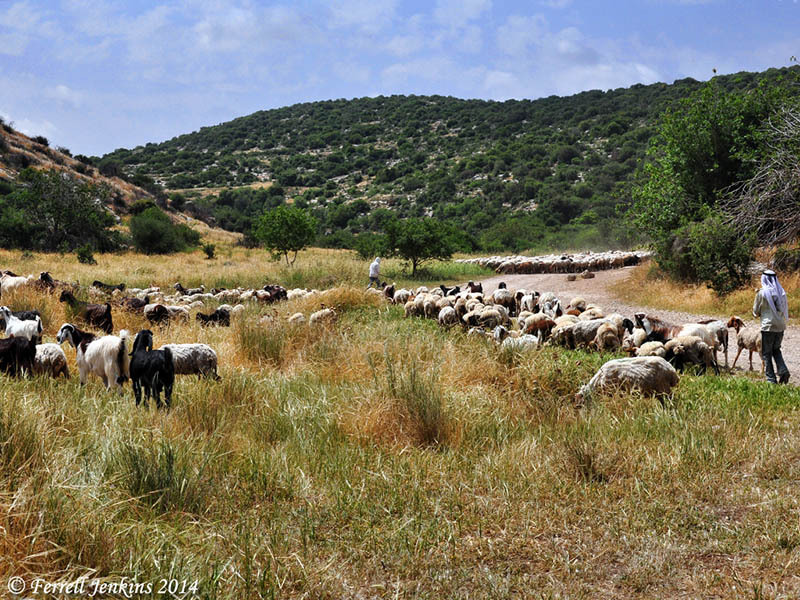 Most of the shepherds that I have seen throughout the Middle East carry a short staff – one that comes about waist high. Psalm 23 is one of the best known and most loved chapters of the Bible. In it David describes his relationship to the LORD under the analogy of a sheep and his shepherd. This Psalm describes one of the common scenes in certain parts of the Middle East. 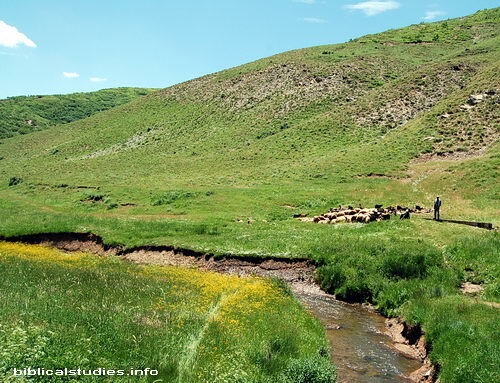 Our photo was made in the mountains of ancient Urartu (Ararat) in eastern Turkey. Notice especially the green pastures and the quiet waters. A shepherd provides green pastures and quiet water for his sheep. Photo by Ferrell Jenkins. Jesus called Himself the “good shepherd” (John 10:11, 14). Jesus wants the same of elders or overseers in the local church, and He reminds them that it is God’s flock and that He is the Chief Shepherd (1 Peter 5:4). Good shepherds serve God’s flock willingly to provide food, care, and protection for the sheep. The concept of “lording it over” the flock or “domineering” is foreign to the spirit of a good shepherd. Overseers lead the flock by their example of godliness.